Canada Olympic Park was a major venue during the 1988 Winter Olympic Games and now hosts skiing and snowboarding programmes every winter. It also houses the Canadian Olympic Hall of Fame and Museum, and is frequently used as a venue for festivals and events in Calgary. Known to locals as COP, it remains a chief tourist attraction for casual visitors and winter sports enthusiasts alike. 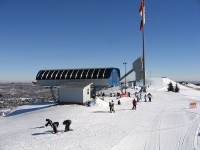 The park is operated by WinSport Canada and is used year-round. In summer, it is used for sports like mountain biking and there are obstacle courses and zip lines to conquer.